More than just the design or visual aspect of your website, user experience also involves whether consumers can even find your site and how they feel once they get there. In addition, as user attention spans begin to shorten, the need for a seamless and enjoyable online experience increases. 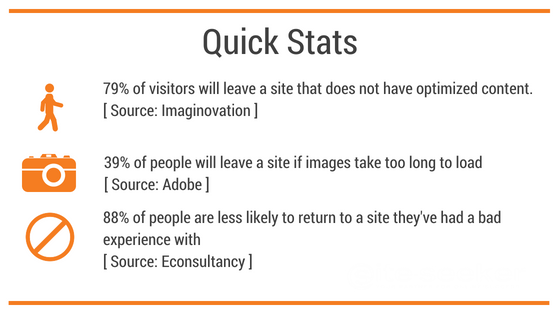 No one likes to wait around for a page to load or to sift through content to find the information they need. And even if the information is easy to find, if your site is dated or the content is boring, they’ll go somewhere else. And even just mastering all that isn’t good enough. There are many new concepts that go into creating a stellar user experience that we didn’t have to worry about 3, 2, or even 1 year ago (like mobile-first design, chatbots, rich snippets, and fast load times). But in 2018, it’s more important than ever. You may be familiar with the term “search engine optimization,” but more important to user experience today is searcher intent optimization. This takes into consideration not just what a user was searching for before they landed on your page, but what information they were intending to find. There is a difference. Informational. Arguably the most popular search type, these are all searches that intend to find information. Whether it’s research for a school paper, looking up the weather forecast for the week, or finding a hairdresser near you. With these types of searches, people seek to find an answer to a question or to find out more about a topic. Navigational. The intent of this type of search is to find a certain website. People may type in “seo keyword finder.” Their hope is to find a site (a tool) that will help them identify relevant keywords. If your site does this then hopefully you’ll rank higher in search results and drive more organic traffic. Transactional. Transactional searches are performed when a user intends to make a purchase. This could be someone looking to find Nike sneakers in their size or maybe they’re looking for Memorial Day weekend sales. These are transactional searches and are beneficial to you if you have e-commerce as part of your business. These are the three main search intentions, but why are they important to your business in 2018? Because understanding how your customers will find you is essential and it will transform how you think about moving visitors through your site and how you create content for it. Make sure you’re driving customers to your product pages if they’re performing a transactional search. You don’t want to bog them down with lengthy articles or overwhelm them with text if they’re looking to find a specific product and make a purchase. Instead, optimize the page for conversions. Conversely, if they’re performing an informational search, make sure you’re providing all the relevant information they need without having to click around to several pages. People want to find the information they need, quickly. Don’t always take this as an indicator that you should write paragraphs upon paragraphs of content, and if you do then make sure it’s well organized and easy to scan. Just pay attention that the information is easy to read and important points are called out. When a user conducts a navigational search they’re essentially searching for a tool or a website for a specific purpose. You want to position your site as the solution to whatever problem they are trying to solve or the tool that can help them. But don’t get caught up in trying to be the solution for everyone. Focus on what product or service your business offers and optimize for that. Of course, you still want people to take the actions that YOU desire as well (i.e. contact you). A great marketer attempts to combine those two goals: make it easy for people to get to the action/information that they want, while also marrying it with what you want them to do. This is one of the reasons a website chat feature is so effective: it serves the immediate needs of the user and also lets the business interact with them and try to guide them toward a purchase (now, or in the future by collecting their email address). As discussed above: Google, Bing, and the major search engines look for signals to indicate to them that the searcher intent was satisfied. They also look for signals that the searcher had a good experience on your site. They can look at data such as dwell time, whether the searcher performed another search, how long they waited to do so, and how many pages they visited (we suspect that they also note how well a website converts users to complete a goal). A website that serves the intent while also being pleasant to use (watch: “Good Design Makes You Happy” to understand why this matters) or that contains engaging content (such as video or interactive apps) will improve these signals and enhance your performance in search engines over the long run. An interesting thing to note is the existence of Search Quality Evaluators. Yes, there are actually people out there who are contracted by Google to manually evaluate how accurate/relevant search results are to what people are searching. They use a 200-page document that outlines what to look for, positively or negatively, when making their evaluations. However, raters do not directly change the search result. (You don’t have to worry that one bad grade is going to force your page to the back of the line). Instead, the information is used to help make the Google algorithm better by letting Google know how well it’s doing. That said, you can take steps to ensure that the graders rate your performance well by meeting basic standards such as mobile optimization and by understanding searcher intent for the phrases you rank for. This is a good thing to keep in mind when evaluating your web presence to understand that it’s not ONLY statistical algorithms at play. It also helps to underline the importance of a great User-Centric Experience in Google’s eyes. While this is just the very tip of the iceberg when it comes to the field of UX, simply applying these principles to your SEO strategy will pay dividends over time. If you want to improve your visitors’ user experience, but aren’t sure where to start, fill out the form below and we’ll get in touch.